Current selected tag: 'water'. Clear. I've shared some more substantial resources about maritime claims in the South China Sea than this flippant political cartoon. Still, this cartoon beautifully illustrates a geopolitical perspective quite powerfully. As always, use your own discretion when sharing resources in your own classroom (my college students love this). "The vast majority of fishing vessels follow the rules governing fishing – but many are not, and these bad actors can cause a lot of damage. Vessels may take too many fish ­– overfishing – which is causing our fisheries to collapse. Then there is the problem of illegal fishing, which can occur in protected areas, in another country’s waters or on the high seas. This threatens jobs and food security for millions of people, all around the world. The trouble is, so much of this illegal activity is hidden – it happens out to sea, making it difficult to scrutinize what individual vessels are getting up to. Fortunately, we are now beginning to see what happens after commercial fishing vessels leave port. The interactive map we created allows anyone in the world with an internet connection to see the activities of the commercial fishing fleet globally." Scoop.it Tags: water, conservation, biogeography, environment, pollution, resources, mapping, food production, agriculture. WordPress TAGS: water, biogeography, environment, pollution, resources, mapping, food production, agriculture. "This photograph, taken by an astronaut aboard the International Space Station, shows the straight line of the Corinth Canal as it crosses a narrow isthmus between mainland Greece (right) and the Peloponnese Peninsula. The canal cuts through the narrowest part of the isthmus of Corinth. The goal was to save ships from the dangerous 700-kilometer voyage around the ragged coastline of the peninsula." Questions to Ponder: What does the word Isthmus mean and how does this image help tell that story? When did people start modifying Earth's physical systems? What factors do we need to consider when evaluating the impacts of human modifications to the environment? Tags: water, coastal, landforms, Greece. 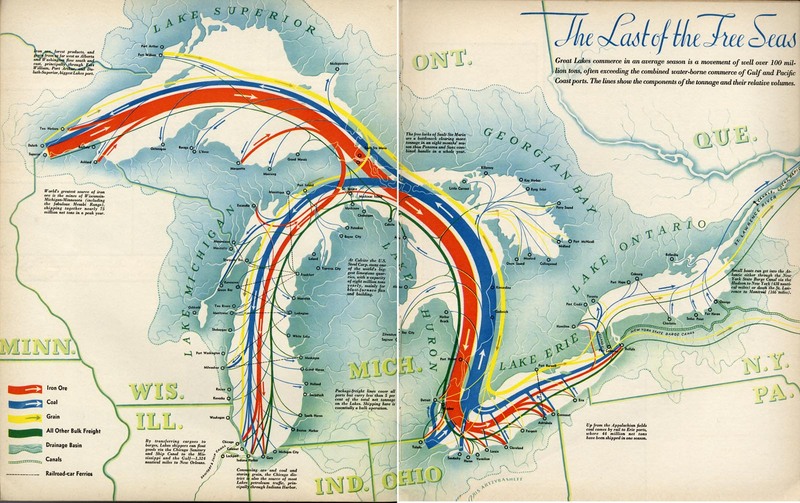 "The Last of the Free Seas"
"The Last of the Free Seas is the title of this fantastic map of the Great Lakes made by Boris Artzbasheff. It was published in Fortune Magazine in July 1940." "A 7,000 km barrier is being built along the footsteps of the Sahara to stop the desert expanding. The Great Green Wall project started in 2007 in Senegal, along with 10 countries in Africa to combat the effects of climate change. Al Jazeera’s Nicolas Haque reports from Widou, deep in the Sahel." The Great Green Wall initiative is composed of 11 countries that are cooperating together to combat the physical and human geographic characteristics that make the Sahel one of the more vulnerable ecosystems in the world. This swath running through Africa is the transition zone where tropical Africa meets the Sahara. The Sahel is susceptible to drought, overgrazing, land degradation and desertification. These issues of resource management and land use transcend international borders so this "Green Wall" was created with the intent to protect the environment, landscapes and people of the Sahel from desert encroachment (the shorter, social media friendly version of this video is available here). This “Green Wall” was originally supposed to span the southern border of the Sahara from the east to west coast of Africa. It was made up of trees and elements of forests in order to prevent the desert from expanding and reducing the amount of land available for food production. This seems like it would be a great idea that would work well, but the plan has some flaws. In the early stages of building up the barrier, nomadic herders are supposed to be prohibited from using the land, as their cattle would destroy it. However, the system in place in Somolia sees only one soldier guarding hundreds of kilometers by himself. The nomadic people are often desperate for food, so they often try to break in and sometimes resort to violence. This is problematic because it defeats the purpose of the barrier in increasing the farm land. Many of the countries in along the “Green Wall” do not maintain it as well as they should and Nigeria actually abandoned the project all together. For this reason many ecologists believe the effort is a waste and the climate change can not be stopped. But the efforts of the Somalians has paid off. Crops such as grapefruit and watermelon have been grown in areas that would have been unsuitable for such crops a few years ago. Migratory European birds also settle in the area during the winter. Another benefit that comes from the Wall is that nomads are not forced to join terrorist organizations as their only sources for food, because farming is made easier in the Sahel. The great green wall is a man made ecological wall from the Atlantic ocean thru 10 countries to the red sea. This is to prevent the desert from expanding, but also it is protected from nomadic herders, and loss of food. This project still has a long way to go but ha not been completely abandoned yet. Although Senegal is one of the few countries in the Sahel to actually follow through on its promise of building its green wall, it may be fruitless in the long run. The expansion of desert regions seems relentless. However, what is most surprising is how rapidly the ecosystems have changed and the crops that can be grown there. Watermelon, grapefruit, and European migratory songbirds have all taken hold, drastically altering the agriculture and environment of the region. "The Sargasso Sea occupies almost two thirds of the North Atlantic Ocean. Within this sea, circling ocean currents accumulate mats of Sargassum seaweed that shelter a surprising variety of fishes, snails, crabs, and other small animals. The animal community today is much less diverse than it was in the early 1970s, when the last detailed studies were completed in this region. This study shows that animal communities in the Sargasso Sea are definitely changing. The next step is to find out why." Often, we define oceans and seas based on their borders with land as their defining characteristics (this is one reason why many don't know about the Southern Ocean as a distinct body of water or consider it an ocean). The Sargasso Sea is defined by ocean currents; it is surrounded by great currents but is itself without a strong current, making it perilous for early seafarers. These oceanic doldrums became shrouded in superstition as stories of the fabled Bermuda Triangle spread, but the truth is all in the ocean currents. Tags: water, biogeography, environment, physical. Streamer is a new way to visualize and understand water flow across America. With Streamer you can explore our Nation's major streams by tracing upstream to their source or downstream to where they empty. "Blue and her team selected 45 stories, each plotted with ESRI’s ArcGIS software on a map of Greater Houston and tied to the exact location where it was first told. The resulting story map of Hurricane Harvey, ‘Damaged and Defiant: Houston Stories,’ was published in the Houston Chronicle in December. The map shows short narratives gathered by Chronicle staffers from people across the area — from Crosby to Kingwood to Katy — each a unique perspective on the storm; told together, they’re the collective account of a city that experienced one of the worst natural disasters in U.S. history." "Unchecked development remains a priority in the famously un-zoned city, creating short-term economic gains for some, but long term flood risk for everyone." Houston's development boom and reduction of wetlands leave region prone to more severe flooding. Here is a great map of the change in impervious surfaces in the region from 1940 to 2017--when you combine that with record-breaking rainfall the results are catastrophic. But a local understanding of place is critical and this viral post--Things non-Houstonians Need to Understand--is pretty good. Tags: physical, fluvial, water, coastal, urban, planning, transportation, architecture. Un dossier sur les inondations à Houston (en anglais). La présentation est très originale. Federal maps help determine who on the coast must buy flood insurance, but many don't include the latest data. Maryland is now making its own flood maps, so homeowners can see if they're at risk. Geographic themes are overflowing (it was an unintended pun, but I'll just let that wash over you) in this podcast. I suggest playing a game early in the year/semester called "find the geography." What geographic theme/content areas will your students find in this podcast? Tags: podcast, mapping, cartography, climate change, environment, water, coastal, urban, planning, urban ecology. "China is building islands in the South China sea and its causing disputes among the other nations in the region; Malaysia, the Philippines, Brunei, Vietnam, and Indonesia. China claims they aren't military bases, but their actions say otherwise. The US has many allies in the region and uses its massive Navy to patrol international waters, keeping shipping lanes open for trade." China is being very sneaky in their attempt to control the South China Sea and have decided they don’t want to listen to any international laws or court rulings that don’t follow what they want. In order to strengthen their claims to the South China Sea and increase their land holdings, the Chinese have decided to literally build islands in the body of water. These islands are then used as naval bases to help them take over other islands that are held by other countries in the South China Sea. Their strategy for taking over these islands is called the “Cabbage strategy” where they quietly surround and blockade the islands from the countries who hold control over them in order to take them over. As much as the other countries bordering the South China Sea do not like what China is doing, they are unable to challenge them too much because China’s navy is the most powerful in the region. This is a situation that shouldn’t be so escalated because international maritime laws have established that countries can control the water 200 miles off their coasts, which would mean China would control part of the sea, other East Asian countries would control part of the sea, and the center of the sea would be international waters. However, the natural resources in the sea are irresistible to China, so they have started literally building islands and taking over tiny islands that would normally have no one on them. Other countries in the South China Sea have responded by building and settling on these ridiculously small islands as well. China has now taken their claims a step farther and claimed airspace above the South China Sea. The recent breakthroughs in technology have changed the way that governments can claim their borders and made geography more complicated. The reason that China has been getting away with this is that no country except the U.S. can keep China in check. However, it would be impossible to threaten China with the American Navy without causing a much bigger military conflict. So for now, China quietly continues taking over the South China Sea. The vast resources in the South China Sea and the benefits of the Exclusive Economic Zone make it clear why china wants and currently is building islands in the South China Sea. By occupying these newly created islands and claiming them for their own, they can extend their area of economic control by 200 nautical miles. For a nation that is rapidly industrializing and is heavily dependent on fossil fuels, these new areas of control are monumentally important. China is attempting to extend their EEZ by building islands in the South China Sea so they can claim the area 200 miles off the coasts of these man made islands. This is a problem because of the other countries that have EEZ claims in the South China Sea because if China claims more land it takes away the EEZ zones of some of these other countries. This connects to the physical geography of Israel as it was once incredibly dry, facing a decade long drought. This ruined the agriculture sector of their economy as well, along with changing the people's way of life. However, desalination has saved the country, and Israel really had no other choice. Instead, the country is now a water giant, and has an overabundance through new technologies.